TrialX | Social Media in Clinical Trials – How effective? Home > Clinical Trials > Social Media in Clinical Trials – How effective? Without clinical trials we cannot expect to see any advancements in medicine; and to participate in one, patients need to be aware of ongoing trials. The National Cancer Institute (NCI) HINTS (Health Information Trends Survey, hints.cancer.gov) found that 34% of Americans have not heard of a clinical trial. For almost everyone, internet is the first source of information after they are diagnosed with a disease and social media has recently been playing a huge role in educating patients. Research firm eMarketer estimates that pharma and health-care marketers will spend $3.1 billion on digital advertising by 2020, up from $1.9 billion last year. Social media provides avenues for increased information sharing in more interactive way where people get advices from fellow patients via online patient communities. In addition, most of the physicians are ready to engage with patients on social media and answer their queries. In other words social media is a place for “interactive” education for patients. Online patient recruitment platforms like iConnect 2.0 help researchers use Twitter and Facebook to spread the word about their research. On twitter, investigators can use hashtags to “tag” clinical trial information related to a particular disease or condition, such as, #myeloma #alzheimers #prostatecancer etc. A social media user can put a hashtag related to a disease in the search bar and access any new information posted about that particular disease. Conference hashtags such as #ASCO2018 #DIA2018 #HIMSS2018 help users follow discussions happening at those meetings. In a cross sectional survey conducted in 2014, O’Connor et al, used Twitter to request other Twitter users to retweet their invitation to be involved in a study. Tweets contained a unique URL which would take the participants to an online survey hosted on the Survey Monkey™ website. The team found that, as a result of 359 researcher tweets and subsequent retweets, a total of 529 mothers accessed the survey. The survey was completed by 299 (56·5%) participants. Facebook has approximately 2 billion active monthly users worldwide, and experts estimate that the U.S. user base alone will reach 162.2 million by 2018. In the mid of last year, Facebook pitched its interface as an online patient recruitment platform having a wide range of targeting options. It allows sponsors and CROs access to large user base which they can segment based on trial inclusion criteria. Facebook’s demographic targeting options may allow sponsors and CRO’s to reach prospective study participants based on age, ethnicity, gender, language, and location. Drug Marketers can also target people by demographics and their expressed interests, or likes. Facebook offers an “Interests” section, which provides keyword suggestions and an estimated audience size for each keyword. 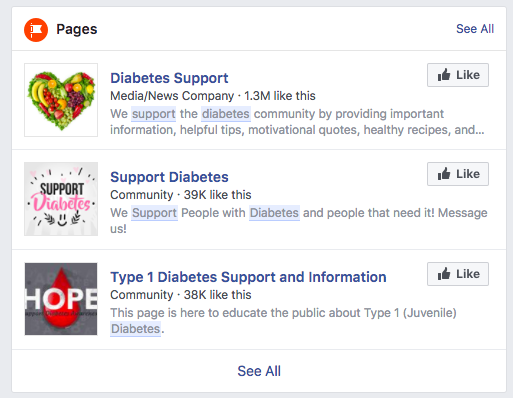 Community support pages related to a disease or condition offer a pool of patients who are seriously interested in receiving any information about that particular disease. 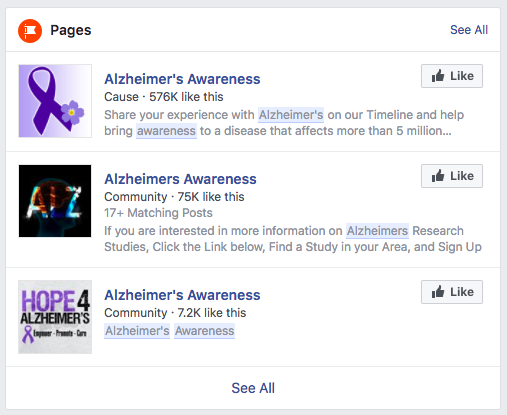 For instance, for conducting an Alzheimer’s trial, users who have liked highly relevant community Pages, such as the “Alzheimer’s Association” or “Alzheimer’s Awareness,” can be targeted. Majority of these community pages have huge number of members, all of whom get notified when any info is posted on these pages. Recently a group at Indiana University School of Medicine, conducted a study to learn about feasibility of leveraging Facebook for recruiting patients for a study on Autoimmune Hepatitis (AIH). The researchers established a physician-led Autoimmune Hepatitis Research Network (AHRN) on Facebook in 2014 to provide current AIH literature, discussion of study results and application to patient care, and spread the word on participation opportunities in the ongoing GRACE study (Genetic Repository of Autoimmune Liver Diseases and Contributing Exposures) – the aim of which was to investigate genetic and environmental underpinnings in disease development and clinical outcomes. After the approval of the institutional review board, the study advertisement was posted on the AHRN Facebook group at quarterly intervals over 24 months by the group moderator. The message that consisted of a recruitment message, study summary sheet, and representative study image, asked interested individuals to contact the study coordinator to discuss study objectives and subsequently give consent by phone. The results published in JMIR in January 2018, showed the authors enrolled 29 participants from 20 different states. Of 29 participants, 28 (97%) successfully completed and returned study instruments within 3 months of the coordinator-led phone consent. Benefits seen by the study team – The authors concluded that their study was cost- and time-efficient and effective at recruiting patients up to 2200 miles away from the medical center. Expenses related to travel, parking, and time of the participants were not incurred, so the participants did not have to be compensated, thus reducing the cost of the study significantly. Furthermore, the web based approach allowed participants to complete the study procedures at their convenience rather than on the schedule of the study team, thus saving their travel time too. However, in a 2017 CISCRP perception and insight study, performed on 2,194 past study volunteers, a comparison of top 5 ways by which people learned about a clinical trial, ranks “Social media” as 5th with only 5% using it to first learn about a clinical trial. Most study volunteers (23%) said their “Personal doctor or Nurse” were their first source, followed by 18% choosing “Outreach directly from research center”. TV/ Radio/ Newspaper advertisement and online registry or trial listing come on the 3rd and 4th places, with 16% and 9% volunteers using these to learn about their first trial, respectively. Our thinking somewhat goes along with CISCRP’s finding. Since, most of us search for our specialists by looking at their online profiles, the research they have been involved with and the reviews they got, we thought, one way of increasing people looking at a clinical trial information is adding that information right where the patient is. We found that adding a clinical trial information directly on the investigators/physicians profile page, increased traffic to that clinical trial page dramatically. This is expected to lead to more referrals and hence increased recruitment. At the same time, a deeper look at the source of the traffic on one of better performing clinical trials reveals that 2/3rd of the traffic came from Facebook. So what is the most effective method to spread the word about clinical trials? TrialX also believes that providing avenues to investigators, by which they can share knowledge with their patients in online forum discussions, such as those on CureTalks, can be another very effective way to increase the reach of clinical trials to the patients.